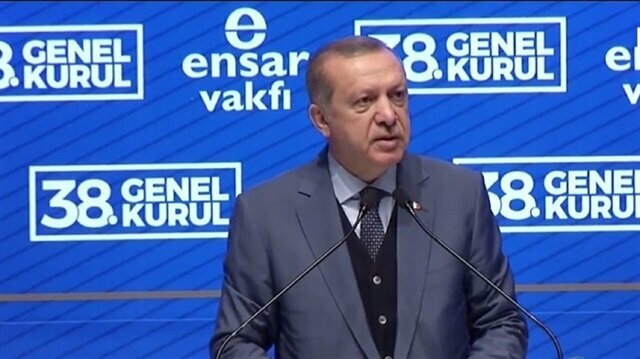 Turkish President Recep Tayyip Erdoğan delivered a speech at Ensar Foundation’s General Assembly, held at the Istanbul Congress Center. President Erdoğan said, “I would like to express my gratitude toward all who have contributed to our foundation since its establishment. “We demonstrated the confidence we have in our youth by lowering the age of candidacy. Now, we will work harder. Our youth will show how to subject this country to change. I declare that we will provide an opportunity to our youth. I believe our youth will improve themselves in the best way in all areas. Thus, Ensar Foundation and similar NGOs should be competing against each other to raise a generation with knowledge of science, wisdom and morals."